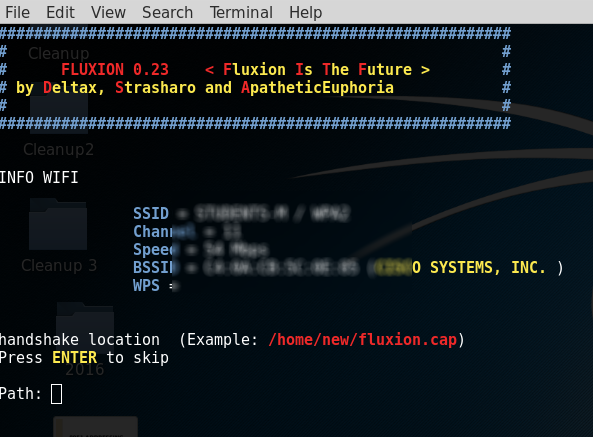 I hadn’t ventured into Hackforums since a while, and this time when I went there I saw a thread about a script called Fluxion. It’s based on another script called linset (actually it’s no much different from linset, think of it as an improvement, with some bug fixes and additional options). 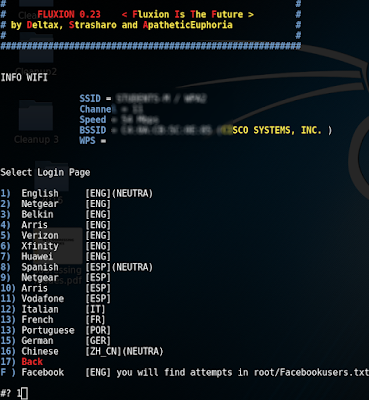 I did once think about (and was asked in a comment about) using something like a man in the middle attack/ evil twin attack to get WPA password instead of going the bruteforce/dictionary route, but never looked the idea up on the internet nor spent much time pondering over it. However, once I saw the thread about this cool script, I decided to give it a try. So in this post I’ll show you how I used Fluxion, and how you can too. 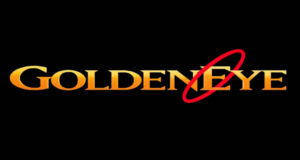 Disclaimer : Use this tool only on networks you own .Don’t do anything illegal. Checking if tool is pre-installed, getting it via github if it isn’t. Running the script, installing dependencies if required. 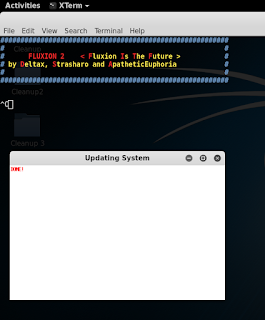 Quick overview of how to use Fluxion. 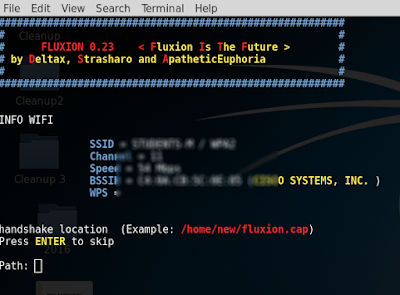 I, personally tried to check if linset or fluxion came pre-installed in Kali (though I didn’t expect them to be there). 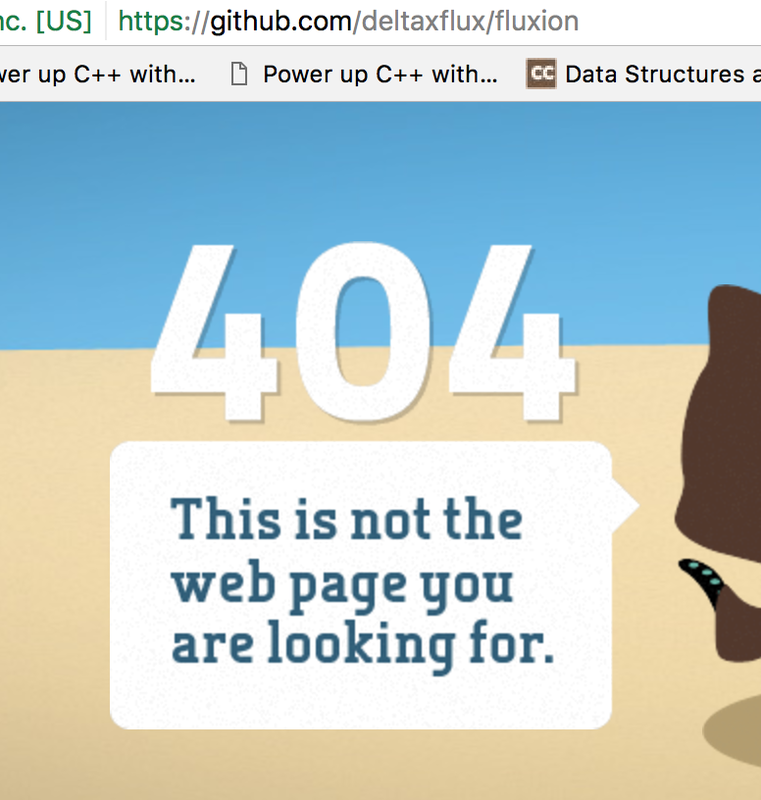 Getting the script is just a matter of cloning the github repository. Just use the git command line tool to do it. If you have any problems with this step, then you can just naviagate to the repostitory (updated link) and manually download the stuff. 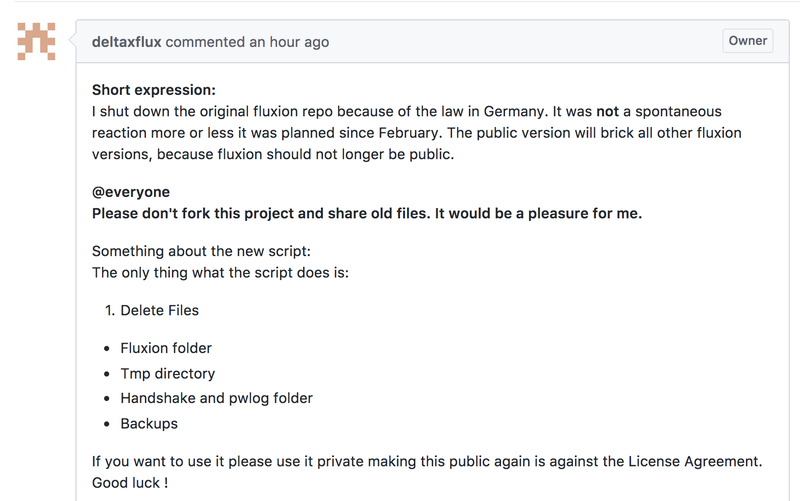 Update : There seems to be some legal trouble with Fluxion. The creator of the script has removed the source code of the tool, and uploaded code that is supposed to delete fluxion from your computer. I don’t know the specifics of what is going on, but will provide updates ASAP. Update 2: Now the repository is gone altogether! What this means : As of now, this tutorial is useless. 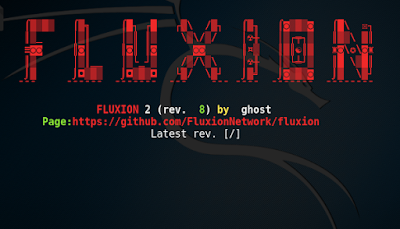 If you can find the source code for Fluxion, then you can use it and continue with the tutorial. Otherwise, not much can be done without the tool. 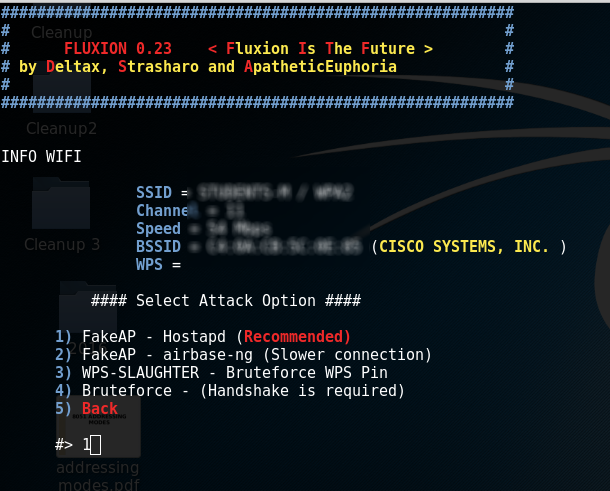 You can try this repo – https://github.com/wi-fi-analyzer/fluxion. It’s an old version, might or might not work. If you have any unmet dependencies, then run the installer script. I had 4 unmet dependencies, and the installer script run was a buggy experience for me (though it might be becuase I have completely screwed up my system, editing files I wasn’t supposed to and now I can’t get them back in order) .It got stuck multiple times during the process, and I had to ctrl+c my way out of it many times (though ctrl+c didn’t terminate the whole installer, just the little update popup). 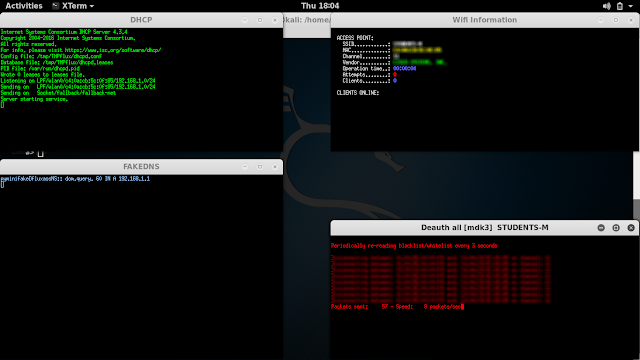 Also, I ran the installer script twice and that messed up with some of the apt-get settings. I suggest that after installation is complete, you restore your /etc/apt/sources.list to it’s original state, and remove the bleeding edge repositories (unless you know what you’re doing). To know what your repository should look like, take a look here. 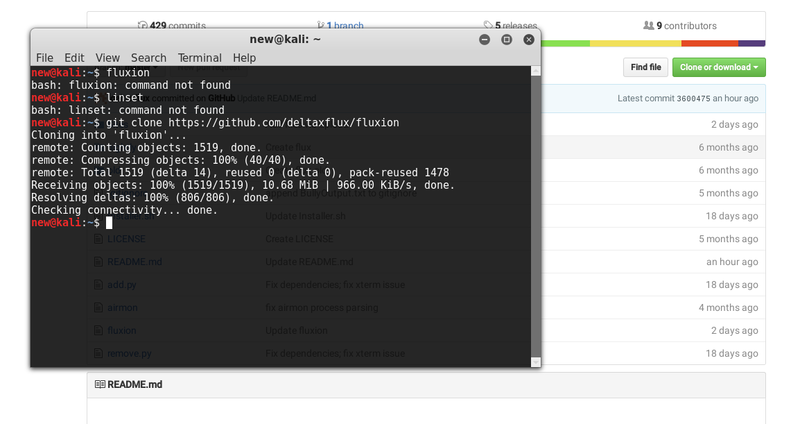 Anyways, one way or the other, your unmet dependencies will be resolved, and then you can use Flexion. The only difference lies in the directory structure and name of script. 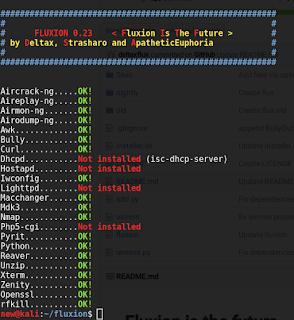 The install.sh script is in the fluxion/install/ directory and not fluxion/ (and is called install.sh instead of Installer.sh) . Basically you just have to change one line. 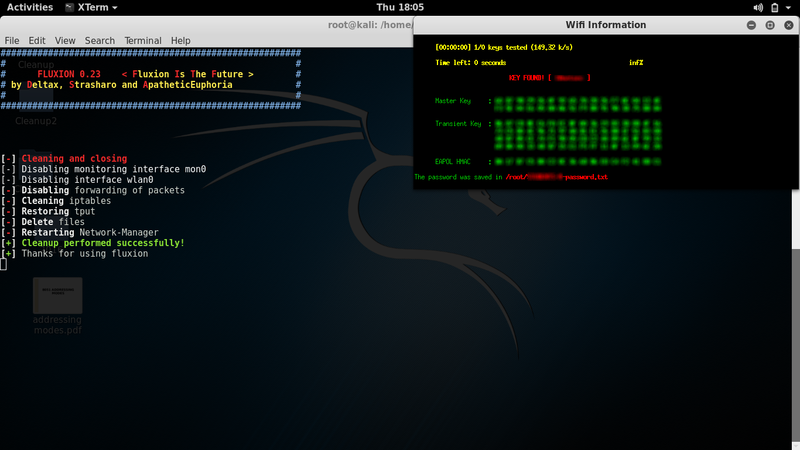 Run the below command on terminal and wait for it to finish executing. Then proceed. This time it should run just fine, and you would be asked a few very simple questions. For the wireless adapter, choose whichever one you want to monitor on. For the channels question, choose all, unless you have a specific channel in mind, which you know has the target AP. Then you will see an airodump-ng window (named Wifi Monitor). 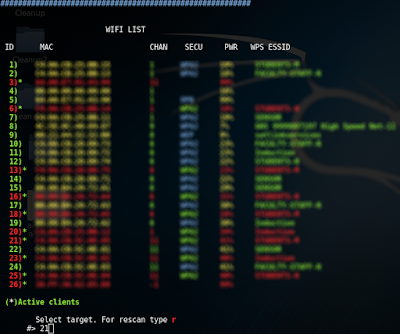 Let it run while it looks for APs and clients. 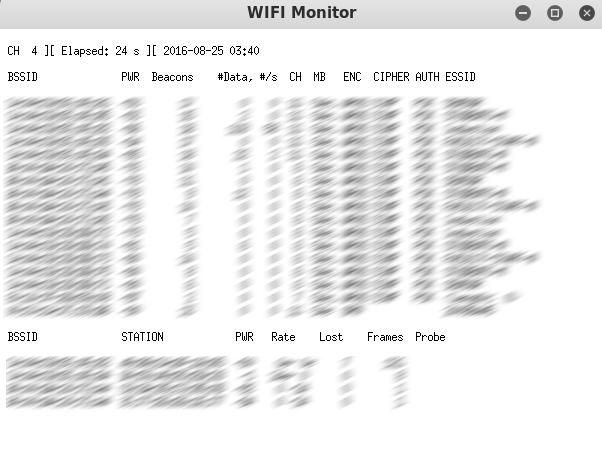 Once you think you have what you need, use the close button to stop the monitoring. You’ll then be prompted to select target. Then you’ll be prompted to select attack. Then you’ll be prompted to provide handshake. If you don’t have a handshake captured already, the script will help you capture one. It will send deauth packets to achieve that. After that, I quit the procedure (I was using the script in my college hostel and didn’t want to cause any troubles to other students). If you are with me so far, then you can either just close this website, and try to use the tool on your own (it look intuitive enough to me), or you can read through the test run that I’m going to be doing now. So, in this example run, I will try to find out the password of my wireless network by making my smartphone connect to a fake AP, and then type out the password in the smartphone, and then see if my Fluxion instance on my Kali machine (laptop) gets the password. Also, for the handshake, I will de-authenticate the same smartphone. This section is going to be a set of pictures with captions below them explaining stuff. It should be easy to follow I hope. 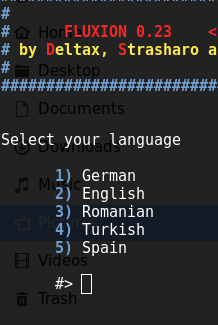 After selecting language, this step shows up. 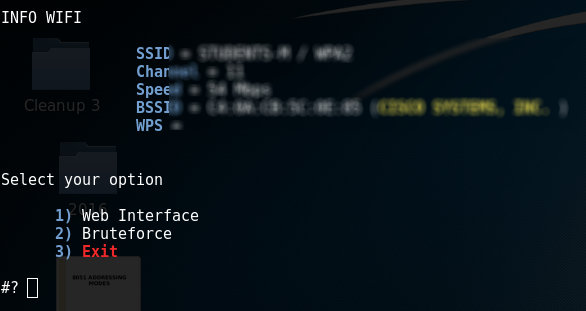 Note how I am not using any external wireless card, but my laptop’s internal card. external card (and if you are on a virtual machine you will have to use an external card). 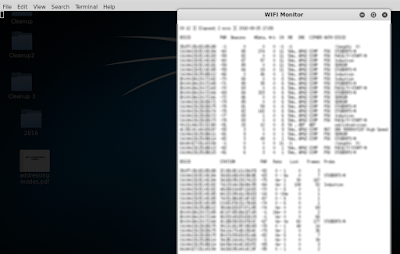 The scanning process starts, using airodump-ng. You choose an attack. I am going to choose the Hostapd (first one) attack. tool to use to do that. I’m go with aircrack-ng. you’ll go to the next step. not what we are using this script for). 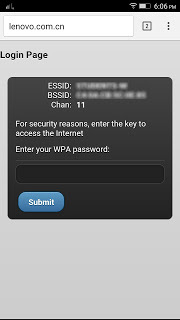 WPA network’s password. I went with the first choice. After connecting to the network, I got a notification saying that I need to login to the wireless network. 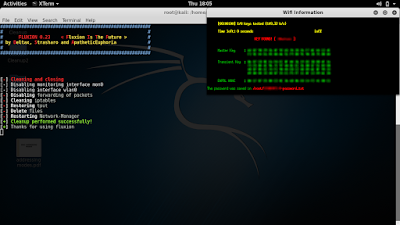 but assuming the client will type the correct password, we can still make the attack work. Aircrack-ng tried the password again the handshake, and as expected, it worked. 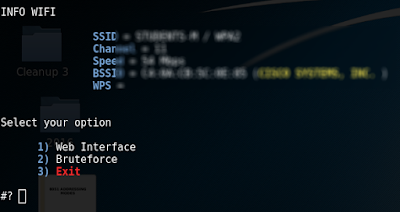 We successfully obtained the password to a WPA-2 protected network in a matter of minutes. 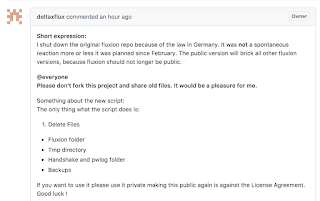 PS: The creator of the video has forked the Fluxion repository, and in the video he cloned from it instead. You may choose to fork from either of those. The original repository being more updated, and forked one being more stable (but less frequently updated). As of the time of creation of the video, both the repositories were the same, so it doesn’t make a different which one you clone, but this may not always be the case. In case of any issues, you can probably try cloning both and see which one works for you. 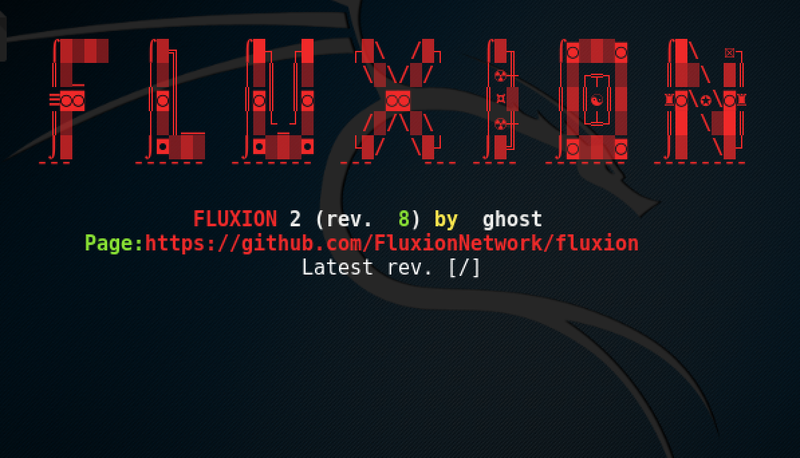 Since fluxion and Kali both are constantly evolving (you might be using a different rolling release of Kali, as well as a different version of Fluxion. There are times when the tool break, and there’s an interval of time for which it stays broken. Look at the issues page, and you will most probably find a fix for your problem. Note that the issue may as well be in closed issues (it would most probably be in closed issue). Update : There are some important things mentioned in the README.file on the github repository. See if that helps. There might be a problem with lighttpd. 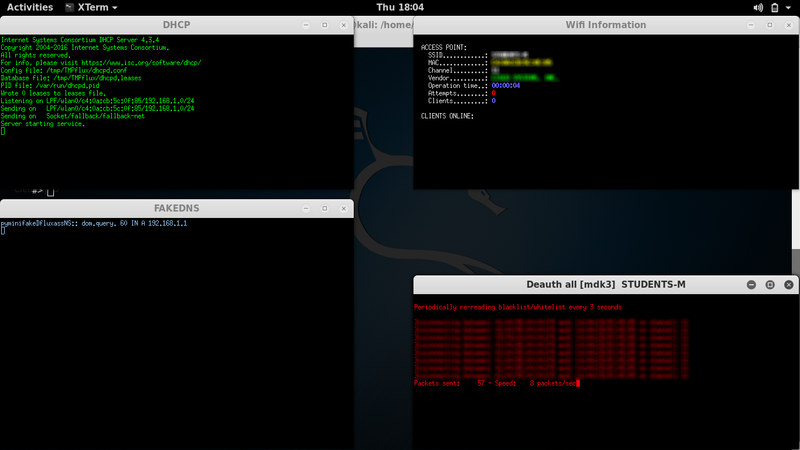 The experimental version is tested on lighttpd 1.439-1. There are some problems with newer versions of lighttpd. If you problems use the stable version. Check the fix out. You are doing some step wrong (easy to fix, follow the tutorial again). There is a dependency issue somewhere (some tool has it’s wrong version installed). This can be a pain to fix, and there’s no guidance I can provide for it really. 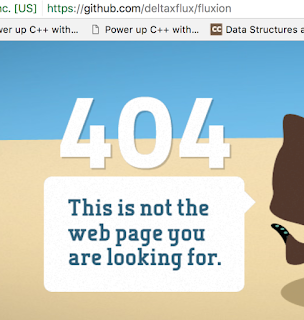 You’ll have to filter through all the issues on the github page of the tool. 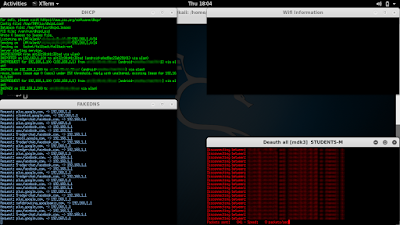 Hopefully, as the tool grows popular, it’ll get more full time developers, and then get integrated in the Kali repository, till then, these problems will continue. I illustrated one possible scenario. 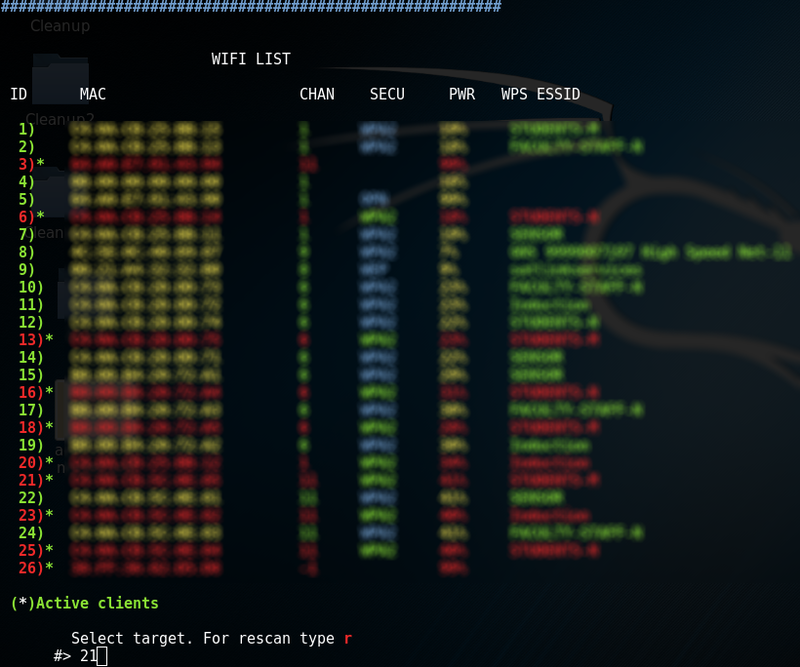 This script can work with other devices (laptops for example) too as the fooled clients (not just smartphones). 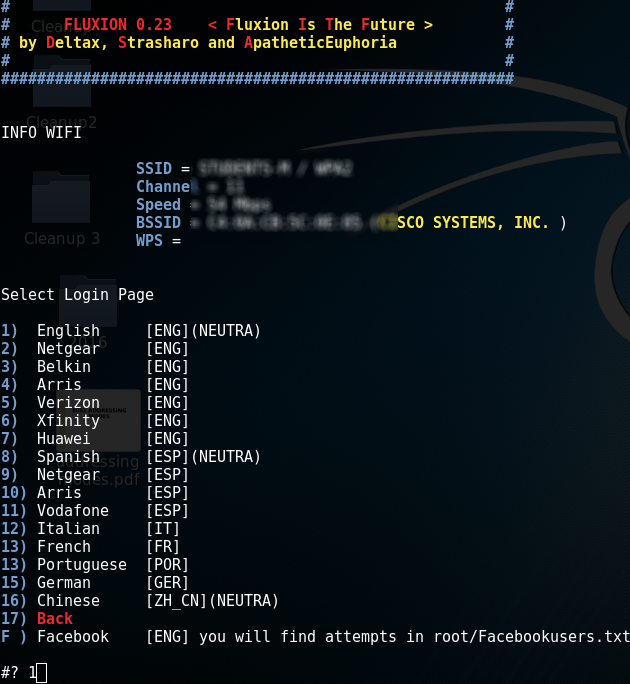 One possible short-coming to this attack is that most smartphones/laptops these days don’t automatically connect to open networks (unless they have before), and hence the user has to do it manually. 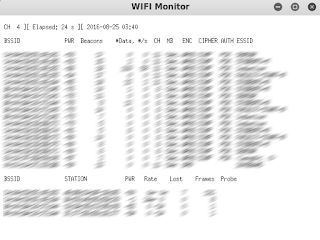 If your fake AP has more signal strength than the real one, then a person who doesn’t know about WPA and open networks could very easily end up connecting to your network instead. So, overall this attack has a fair chance of succeeding. Have any problems/comments/suggestions, leave them in the comments below.